Through a photography workshop at Khao Kheow open zoo of Thailand the ‘National Geographic’ wildlife photo-journalist Joe Riis inspires the new generation. Born to a wildlife biologist and raised on a farm on the prairies of South Dakota, wildlife photography was a natural career option for Mr. Riis. Yet it wasn’t until graduation that he actually realized this dream. Post his college graduation as wildlife biologist in University of Wyoming, Riis started working as a full-time photographer for National Geographic at the age of 23. The Khao Kheow Open Zoo was the chosen locations by the photographer for a workshop he held in March, where Riis’ easy confidence encouraged the students to cross the boundaries of inhibition. In a world where fashion and celebrity photographers outnumber wildlife photographers, Riis promotes the beauty of nature while raising consciousness about wildlife protection. 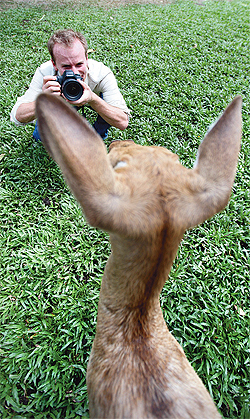 “What are you focusing on?” he asks a teenager taking a picture of a deer at Chon Buri’s Khao Kheow Open Zoo. “Usually if I use the big cameras, I’ll go down low on the ground like this. Try it; Lay down on your stomach. Just try something different.” He tells the student.